Here's your chance to get your hands on the best QWERTY keyboard phone on the market, the BlackBerry Q10. As well as providing a brand new BlackBerry Q10 handset, the kind folk over at BlackBerry have also bundled in additional accessories including a case and external battery pack to make sure your new handset is well protected and even longer lasting. It's a prize pack worth over £500, so certainly not one to be missed! Details on how to enter are below. The BlackBerry Q10 is a 4G enabled handset, allowing you to take advantage of the latest superfast networks. You'll be browsing the web at lightening speeds, as the BlackBerry Q10 has one of the quickest browsers on the market. 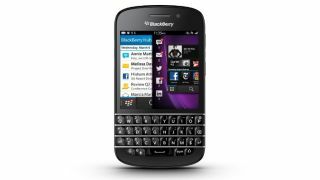 Also featured in the BlackBerry Q10 is a 3.1-inch HD display, 1.5GHz dual-core processor, 2GB of RAM, 16GB of internal storage, microSD slot, 8MP rear camera, 2MP front facing snapper and the new BlackBerry 10 operating system. This competition is now closed. Congratulations to our winner Janice Docherty!